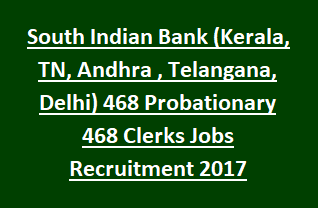 total 468 Probationary Clerk vacancies available in South Indian Bank Recruitment 2017. Eligible candidates have to apply for this SIB Recruitment through the Bank’s official website www.southindianbank.com. Online application form submission starts from 20-12-2017 and last date is 30-12-2017. Candidates will be selected for this South Indian Bank Probationary Clerks Recruitment is based on their merit in Online Test and Interview. For more details of Online test, Interview dates, Syllabus, Age limits, application Procedure, Application fee details of South Indian Bank Probationary Clerks Recruitment vacancies are mentioned below. Total no of vacancies: 468 posts. -Andhra Pradesh & Telangana: 35 posts. Candidate must have passed 10th/ X/ SSLC, 12th/ XII/ HSC and Graduation with minimum 60 % marks. See the SIB Notification for more details. Candidate should have upper age limit of 26 years as on 31-12-2017. Age will be relaxed for SC/ ST candidates is 05 years. See the notification for Salary details. Selection of candidates for SIB Probationary Clerks Recruitment will be based on online test and Interview. Tentative date of Online test will be in the month of January-2018. Online test will be held for 200 marks, consists of 190 questions. - General/Financial Awareness: 50 Qs- 50 marks- 35 minutes. - Reasoning Ability & Computer Aptitude: 50 Qs- 60 marks- 45 minutes. - Quantitative Aptitude: 50 Qs- 50 marks- 45 minutes. Test Centre, Address details are given in the SIB Notification. Interested candidates have to visit the SIB official website www.southindianbank.com to apply online for Probationary Clerk Jobs. Go through the detailed guidelines/ procedures to fill the application. Online application link opens from 20-12-2017 and closed on 30-12-2017.